that the big issues of public ownership, supporting local communities, caring for heritage and environment, and our transport system are the ones that really need front page coverage in the Herald, there is genuine community interest in berms and there needs to be a serious response. So far, the issue has primarily been used by our opponents to try and harvest votes. They offer no solutions, no ideas about how to pay for the service, and indeed were silent on the matter when they had the opportunity to influence it before the Annual Plan was signed off. Our approach is to actually find a workable solution. We know that the rest of Auckland is not going to pay for just the isthmus to have its berms mowed, so we need to develop our own response. In our case, the key is our core value of keeping it local. We say that if local communities believe that berm mowing is important, then we should allow that to continue, funded by a targetted rate at the Local Board level. What also has to be acknowledged up-front however is that Council and Auckland Transport dropped the ball on this one. The communication to the public has been terrible, and had people had a few months warning it is likely that our streets would be far tidier now! 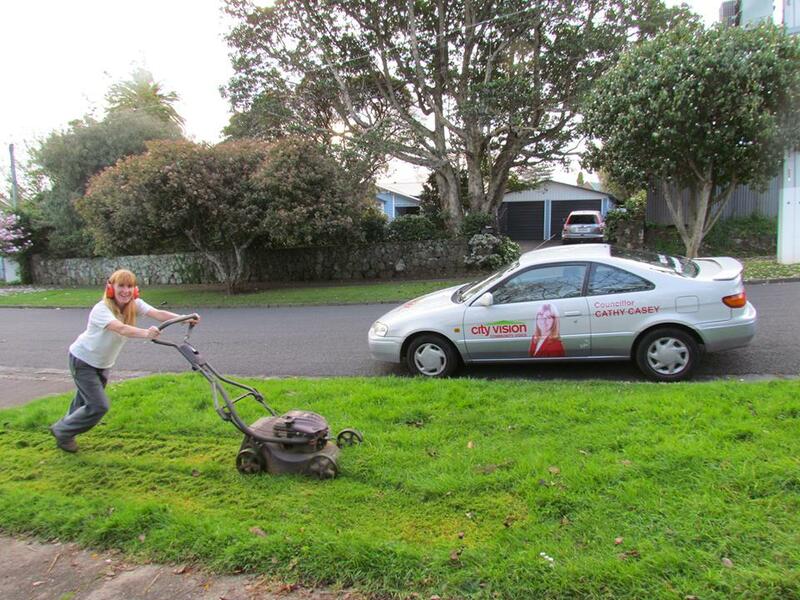 In light of Council communications falling down Cathy Casey has formally written to the Auckland Council CEO saying that berm mowing needs to be re-instated until the end of the year so that we get our streets tidied up now, and to give Local Boards the chance to work out their approach. We also believe that if residents do have to mow berms that there needs to be some added flexibility to go with this responsibility. AT should ease up and allow people to plant trees, flowers, or other plants (within reason) on the berm area to add amenity and reduce the area of lawn. Our opponents continue to complain but offer no way forward. Only City Vision and Roskill Community Voice are offering a solution to get berms tidied now, and to allow local communities to make their own decisions about the issue into the future. I would like to be able to plant flowers on my berm. This is currently illegal, but the point of the rules really seem to relate to large trees, which could damage infrastructure like pluming, pavements, etc. Since we now are expected to care for our own berm, why can’t I take even more pride in my neighbourhood by putting in a bit of colour? Auckland Transport is currently reviewing their berm planting policy and looking to produce guidelines. In the meantime it is not illegal to plant on the berm but responsible planting is encouraged (as you say avoiding large trees and structures).